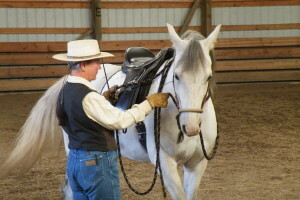 Have you ever noticed that riding with a purpose is not only more enjoyable for you, but your horse seems to react and respond with more enthusiasm? If I have some cows to gather or a new trail to explore, I see the ears on my horse coming alert, her walk picks up, she is in perfect balance, and together we work as a team to accomplish this new job or adventure. My very favorite spring time activity is riding out into the pasture to separate the cows and their new baby calves from those mothers that have yet to calve. My horses truly enjoy the work too, with their mothering instincts rising up as we shepherd the newborns along one step at a time until their baby tails go straight in the air and they burst off in what looks like sheer joy! What fun to have a purpose…a job…a lesson plan for me and for my horse! Read More..